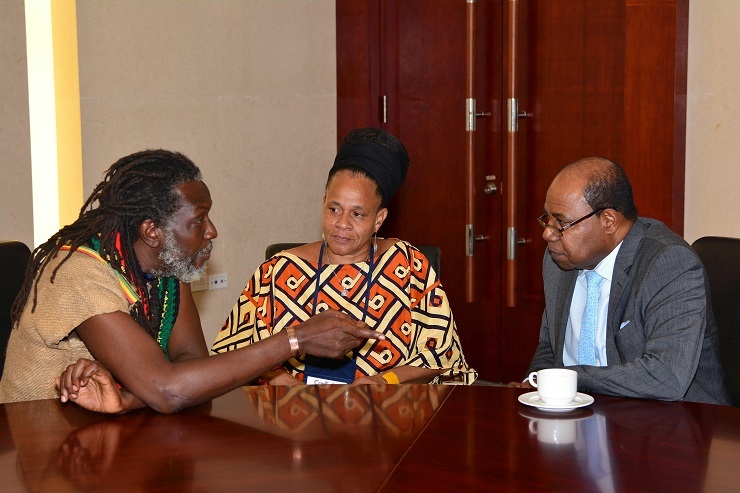 MINISTER OF TOURISM EDMUND BARTLETT (RIGHT) MEETS WITH EDI WRAY, FIRST MAN AND HEAD OF THE RASTAFARI INDIGENOUS VILLAGE AT IRWIN IN MONTEGO BAY, AFTER ADDRESSING CANEX JAMAICA, THE ISLAND’S FIRST CANNABIS-CENTRED CONFERENCE ON THE BUSINESS POTENTIAL OF THE MARIJUANA TRADE. LISTENING ATTENTIVELY IS MITZIE WILLIAMS. Jamaica is trying to cash in on the multi-billion-dollar health and wellness tourism sector that several Caribbean countries are turning to in order to boost visitor numbers, but it won’t be traditional medicine it plans to use to reach a high in tourist arrivals. Minister of Tourism Edmund Bartlett said Jamaica’s lush and rustic southwestern coast is ideally suited for the concept of “cannabis-infused tourism” where products made from the herb would play a major part in the tourism sector. Health and wellness tourism has been identified as one of the key areas of focus under the ministry’s plan to grow visitor arrivals to five million annually, generating earnings of US$5 billion by 2021. He said the global market for that kind of tourism stands at around US$494 billion and Jamaica wants a piece of it. “What we’ve found also is that cannabis-infused experiences have added much to health and wellness across the United States,” the Minister added, citing the US state of Colorado where bookings increased by over 175 per cent when it entered that market, and Amsterdam which has also benefitted tremendously. He said the Health and Wellness Network that he has established in the Tourism Ministry had been tasked with defining the policy that will provide the framework within which the cannabis-infused health and wellness experience will become a reality in Jamaica. “And we’re going to have a full roll-out of that by the end of 2017,” Bartlett disclosed. 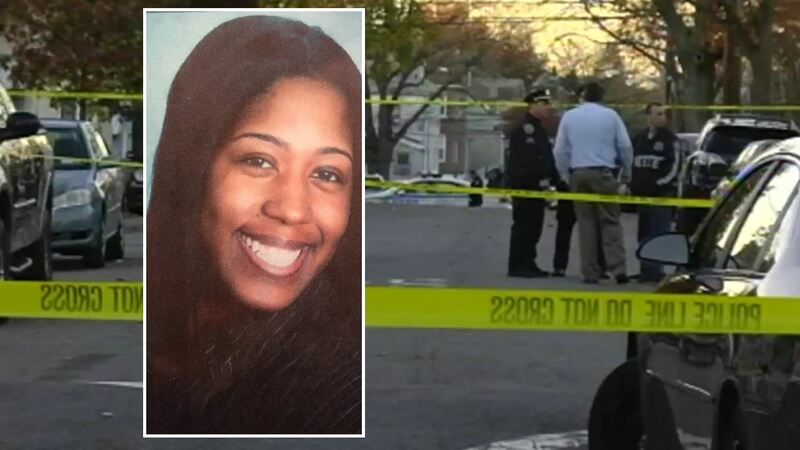 WAKEFIELD, Bronx (WABC) — A woman accused of cutting the unborn baby out of her murdered friend’s womb in the Bronx is being held in the psychiatric ward, and facing murder charges. 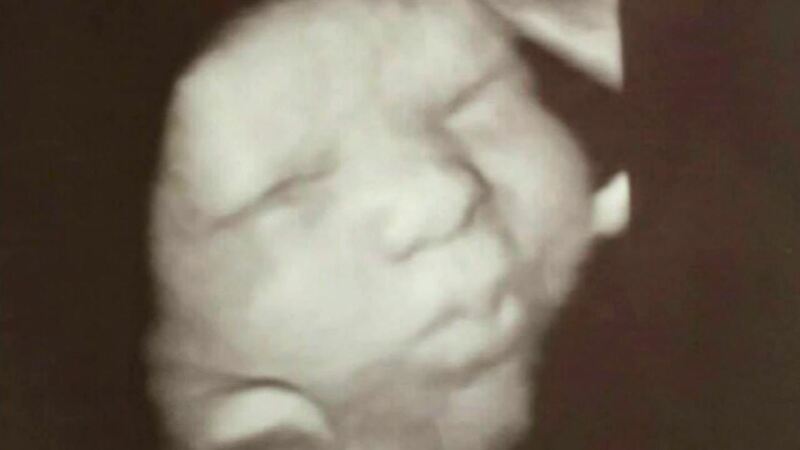 The would-be father was so excited that he posted a sonogram picture on his profile, along with links to baby registries in Wade’s name, that listed a due date of Nov. 16. Wade’s landlord said there was no doubt that her tenant was expecting. However, it was, according to police sources, an elaborate ruse. Wade, they say, was never pregnant — 22-year-old Angelikque Sutton was. “She told me, I saw her – I knew she was pregnant,” said the landlord. SANTA CRUZ, St Elizabeth — The comment by former Prime Minister Bruce Golding hit the funny bone, but for those at a Jamaica Labour Party (JLP) fund-raiser in Black River early this month it also summed up the vagaries of the Jamaican economy. 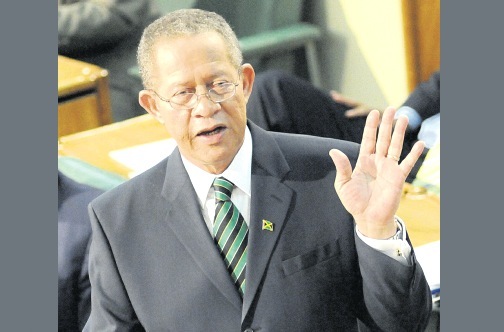 “Sometimes when I look at the Jamaican economy you get a sense that no matter how much black pepper you put up its nose it won’t sneeze,” said Golding, who resigned as prime minister and leader of the JLP in late 2011. He was providing a critique of the People’s National Party Government’s economic programme dictated by multilateral lender, International Monetary Fund (IMF) at the function hosted in Black River by Floyd Green, the JLP’s candidate for St Elizabeth South Western. The former prime minister emphasised that the IMF programme was necessary, and that there were measures being implemented which could not be avoided. However, for Golding, a matter of great concern was what he termed the “internally contradictory” nature of a programme which insisted on economic growth even while “squeezing the life” out of the economy. To meet targets, Golding said, the Government had been forced to increase taxes, though Jamaicans were already at their taxable limit, which itself was a disincentive for production. “The programme essentially is squeezing the economy in order to meet the primary surplus target… In order to get the revenues you need, you squeeze the life out of the economy. Then, if you squeezing the life out of the economy, where is the growth to come from in order for you to achieve targets?” said Golding. Arguing that the Portia Simpson Miller-led Government had been “hoodwinked”, Golding criticised what he suggested was flawed economic theory promoted by the multilaterals. “The multilaterals, the IMF, the World Bank, and to a lesser extent the IDB (Inter-American Development Bank) … have this notion, almost like theology to them, that if you get your fiscal house in order, if you reduce your debt, if you cut your expenditure, then you tighten things and you get your budget and fiscal arrangements in good order, ‘listen, nuh man, you gwine be frighten to see how investment and growth tek place’,” said Golding. But Golding countered that it had been his experience “and the experience of so many countries that I have looked at, which tells me that’s not how it goes”. He contended that there were countries which could “take off” on the strength of such policies. However, those were blessed with abundant natural resources which allowed them to adjust and adapt. He cited Ecuador and Colombia in South America as countries with oil and natural gas which made it easier to recover and grow after economic stress. In the case of Colombia, said Golding, the Government was able to minimise use of natural gas reserves because of abundant rivers providing hydroelectricity to cover most of their energy needs. Jamaica, on the other hand, was a vulnerable, “open” and “exposed” economy. “We can’t lock our doors and batten down,” said Golding. He questioned what he said was a continued low investment climate, despite what were said to be favourable economic indicators which had been commended by the private sector. “There was a time when the private sector used to say the reason you not seeing investments is because interest rates too high. Interest rates are now down. They used to complain that inflation is too high … out of line with main trading partners… Inflation is down. They use to complain about the high cost of energy (but) oil prices down, some say it may go below US$30 a barrel, (yet) investments are not taking place,” said Golding. He suggested that the Government should take proactive action to find out what is holding back investors given the favourable indicators. The Government should set about the task by pulling “together all of its technical agencies”, possibly led by the Planning Institute of Jamaica, the private sector leadership and the multilaterals to do “a serious analysis based on hard data”, Golding said. He pointed to the downturn in economic activity in town centres and across rural Jamaica as evidence of the effect that the “squeeze” has had, leaving “no money out there to spend”. The squeeze on the national budget had also brought political representatives under extreme pressure –none more so than MPs for the ruling party — and had forced drastic cutbacks in government services. A way would have to be found “within the framework of the (economic) programme, but with the clear understanding that the multilaterals are going to have to recognise that the programme is not going to be able to achieve its objectives unless it is calibrated… in such a way that we not only accommodate but can in fact stimulate investment,” said Golding. IT took only eight days for a Gofundme account set up by Sasha Palmer, founder and CEO of fruit popsicle company Liqy Liqy, to raise the money Baby Marley needs to get a medical test abroad. That test will let Marley’s parents know what type of epidermolysis bullosa (EB) the 18-month-old is afflicted with. The test will help to inform the treatment they get for the baby whose story, published in the Sunday Observer on August 23, 2015, melted readers’ hearts, generating 593 Facebook shares and 33 online comments. Palmer was among the readers posting comments. 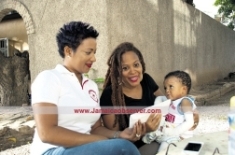 But long before she clicked on the post icon, she had sent off an e-mail with an offer to Marley’s mom, Shauna-Gay Mitchell, at approximately 3:00 am after reading the story online. The offer was to set up a crowdfunding account in order to raise the approximately US$1,600 Mitchell had told the Sunday Observer was needed for the test. Epidermolysis bullosa is a very rare condition that causes the skin to be fragile. It affects one in 50,000 newborns and causes the formation of painful blisters, which can result in serious problems if they become infected. To protect their skin from peeling, EB patients wear bandages. Those bandages are costly, but Mitchell had told the Sunday Observer that, in an effort to keep the costs down, she has devised a system of washing and reusing the bandages. While the illness, which has no cure, usually shows up in babies or at the early stages of a child’s life, some cases are known to have developed during adolescence or early adulthood. Most cases of EB are hereditary. However, Mitchell said that as far as she is aware there’s no history of the illness in her family. “When I saw Marley’s story it touched me. To see a baby in so much pain, bandages…” Palmer told the Sunday Observer. e-mail, but she really didn’t believe that a response to the story would have come that quickly. So, she returned to bed. “By 6:00 am I was getting excited, and I said ‘okay, what’s going on? I need to respond to this e-mail’, but because we were going to the country, and I had to get everybody ready to leave by 7:00 [am] I wanted to sit and respond. I didn’t want to rush it,” Mitchell explained from her Kingston 5 home on the day Palmer visited and presented her with $296,000 — the money donated by 16 people, mostly in Canada, who read Marley’s story as it trended on the Gofundme top 10. For those 16 donors, giving to a fund set up by Palmer was not an issue, because she had already earned a reputation for using crowdfunding to help people in need. Among them are cancer patient Beverly Sobah; the family of Shakera Facey, the 19-year-old who had a huge tumour on her shoulder; and 14-year-old Leslie-Ann Gouldbourne, who has a brain tumour. Palmer came to their aid after reading their stories in the Sunday Observer earlier this year. “Over time, they have seen what I have done with the money they donated, so there is trust,” Palmer explained. Palmer said that when she first approached Mitchell and Marley’s dad, Omarie Case, about using crowdfunding the couple was hesitant. Also, there was the matter of her pride. “I didn’t realise how much pride I had until now, but I was happy that what I got from Sasha was that this was not about me, it was about Marley,” Mitchell told the Sunday Observer. Palmer said that, while Mitchell and Case “didn’t come out seeking help”, she saw and felt their pain. “You can’t blame them, but with the Gofundme, it’s just people who want to help,” Palmer said. “Crowdfunding is a platform that we should not be afraid to use. I’ve seen the effects and the rewards,” said Palmer, who received the Business Journalists Choice award in this year’s Jamaica Observer Mogul in the Making, which promotes young entrepreneurs. She explained that even though the person for whom the account is opened can see the donations as they come in, they cannot see who the donors are. “A lot of people don’t contribute for publicity,” Palmer pointed out. Mitchell revealed that when she saw the donations coming in, she was astounded. In fact, she cried on seeing a donation of just over US$1,000 from a group called Christ Followers. “After I had finished crying and dried my tears, I went over to hubby and showed him,” she said. Now that they have the funds, the couple is making arrangements to take Marley to Cincinnati Children’s Hospital, which has an epidermolysis bullosa centre described by the hospital as one of a few in the United States that provides comprehensive care for the unusual condition. Meanwhile, other Jamaicans have contacted the couple with offers of help, mostly in the form of bandages for Marley. “I’m just so grateful for all the help,” Mitchell said.